The parents of a first-grader killed in the shooting rampage at Sandy Hook Elementary say the loss of their son has put them on a different path. Chase Kowalski's family tells NBC 4 New York that they are summoning the strength, now more than three weeks after the shooting in Newtown, Conn., to talk and move forward because they believe Chase wants them to have a greater purpose -- to help others. "He had a big heart. And he shared with everybody ... 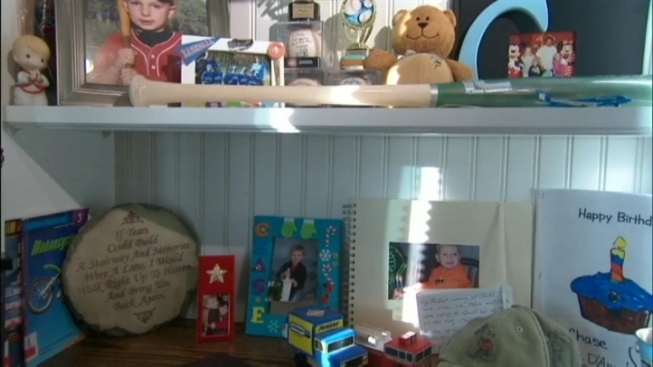 He always found something good in somebody," his mother, Becky Kowalski, says in an interview. After spending a few minutes in little Chase's room, it's hard not to expect him to come running in at any moment. After all, he was a runner, and he has medals and trophies to show for it. He loved the Yankees, and Jimmy Johnson and American flags. Chase just loved, period, his mom says. Chase was the third child, and only boy, of Becky and Stephen Kowalski. He was their joyful surprise, they candidly say. He was among the 20 children slain at Sandy Hook on Dec. 14 by gunman Adam Lanza, 20, who had killed his mother at home before he moved on to the elementary school. The Kowalskis say they they are trying not to hold onto anger in their grief. "If I get angry, evil wins," says Becky Kowalski. "I refuse to let that happen... I'm going to focus on the positive, on the good my son did before he died. And the good I can do in his honor, and in his memory." The Kowalskis believe that Chase is guiding them to move forward and do something that will help all the children of Newtown. Becky Kowalski says Chase came to her in the middle of the night after the shooting and showed her the little fish from "Finding Nemo" to demonstrate how they had to work together for the good of the whole. "And then he just filled my heart with peace, and I was changed," Becky Kowalski says. The family has created the Chase Kowalski Memorial Fund, with the goal of building a community center for the children of Newtown. "This isn't solely for Chase. He is not the only person that perished. He is one of 26. In any way we can honor my son, and all of those teachers and aides, we'll do it," she said. "I feel like I got the peace because he came to me. I can do this," Becky Kowalski says. "My grief is not so overwhelming that I can't move forward. I am moving forward. And I am not walking I'm running. Just like my boy did." Donations can be made to the Chase Kowalski Memorial Fund through its website, Facebook page or by mail to Chase Kowalski Memorial Fund, c/o Peoples Bank, 470 Monroe Tpke, Monroe, CT., 06468.